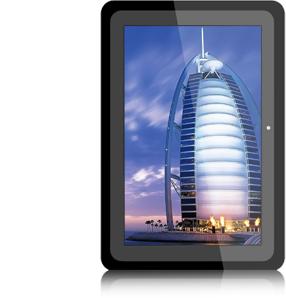 Enterprise Mobility offers most comprehensive, advanced Android tablets System Solution, which looks like a consumer tablet, but it has multiple advanced functionalities, which can be easily utilized for multiple purposes like for advertising/ marketing in retail shops, Hotels, Resorts, educational institutes for running continuously 24/7. Enterprise Mobility Android Tablets are integrated with powerful hardware and Cloud based CMS solutions with cloud signage software, which can be utilized for multiple purpose, and they also provide features such as robust case, VESA mounting, SD and 3G SIM card protection system, anti-theft system, back hidden quick control buttons, high-quality stereo audio output. 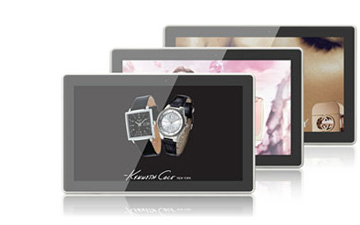 EM Android System tablet Solutions are especially designed with creative IPS screen. IPS hard screen technology is considered as most advanced technology having crystal clear liquid soft screens responses with extra faster touch response, and it displays eye catching brighter, sharper and clearer images. Our experienced and skilled engineers have elegantly designed & developed this exceptional product in medium to large-size to cater of maximum customer requirements and to display best marketing content. The EM Android tablets are equipped with most featured and advanced RK3066 dual core Processor with Cortex A9 chipset technology having peak frequency 1.6 GHz Speed, supporting latest optimized package with ARM artisan processor. The cloud signage software shows exceptional results on it. In EM Android tablets Apps are launched instantly and run smoothly at first instant, it has 1GB (2GB optional) double-channel DDR3 memory. 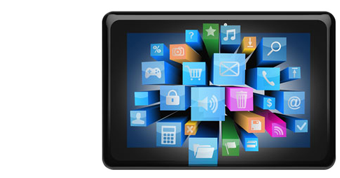 We have developed highly advanced and stylish small and medium-sized, EM Android tablets system solutions which are featured with capacitive multi touch panel. The capacitive touch panel is made of scratch-free tempered glass, and it is presented with double-deck glass process having advanced laser carving. The multi touch panel responses fast and accurately without dead corners, facilitating consumers to easily interact with your designed app providing best user experience. Our large-sized EM Android tablet system solutions are featured with IR multi touch panel, with the most accurate and consistent touch sensing capabilities. The IR touch panel consists of a touch frame, which is installed in front of the panel and it is integrated with a printed circuit board, which contains a line of IR-LEDs and photo transistors which are hidden behind the bezel of the touch frame. 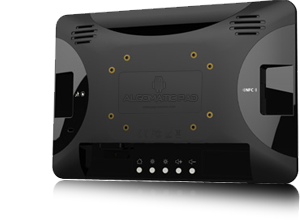 EM Android tablet system solutions is developed most advanced Android 4.1.1, Operating System which applies on all new processing architecture, further it has most advanced dual core processor, which is quite helpful for improving hardware performance. 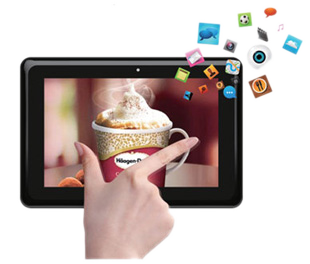 EM Android tablet dual-core processor and Android 4.1.1 OS, has very rapid webpage opening rate, app installation app loading, video and photo loading speed. Our designed Android tablet system solutions can easily be used to run most advanced Android applications, which can also be downloaded from Android App Store. Our design EM Android tablet system solutions is designed with high-quality ABS cases having partial rubber injection, which greatly improves the resistance of the tablet..Our medium and large-sized Android tablet system solutions are designed with high-quality powder-coated metal case with aluminum border which makes the designs quite attractive with stylish looks. EM Android system tablet solutions comes with innovative Vesa Mount having anti theft system based additional ports, which is quite different from other consumer tablets, all the tablets are designed and equipped with VESA mounting holes on the back, SD & 3G SIM card with protection cap and anti-theft cable fixing holes to meet the demanding environment of retail shops. It has built-in Wi-Fi and 3G connections support, also it has support for direct RJ45 Ethernet connection and a SD memory slot to expand the internal memory up to 32GB. 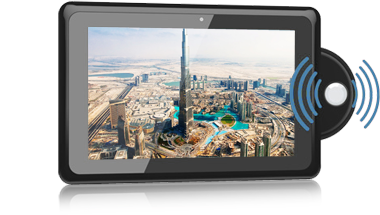 EM Android tablet smoothly plays full HD 1080P videos, and it is fully compatible with 480P and 720P videos in all kinds of formats like: TS, H.264, WMV, MPEG4, etc. Our deigned tablets also support Adobe Flash 11.0 and HTML5 animation technology, which can be easily accessed with the help of dynamic webpage, and on-line videos or games. Our designed EM Android Tablets comes with our best designed and developed cloud based CMS solution which can be easily installed on all our tablets. Our designed EM Android tablets can be easily optimized as default auto start app with full screen display option, without the menu bar ,or with the SD Card stored media files, which can be easily set up in auto repeat loop mode (repeat one, repeat all, or playlist repeat) once connected to power. EM Android Tablets comes with most advanced and innovative features such as motion sensor activation, auto power on and off, password protection, USB auto copy, data performance report, and it is also compatible with a wide range of third-party CMS, EM Android Tablets possess the best android-based cloud signage display.